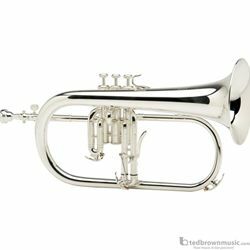 The YFH-8315G us a fresh and unique addition to the Yamaha flugelhorn lineup. The newly designed third valve slide trigger is more ergonomic and will accommodate a wider range of hand sizes. The YFH-8315G features a newly designed leadpipe, outer leadpipe area and a new connection brace between the leadpipe and the valve casing. Traditionally, flugelhorns are made with vertical valve tubing. Monel pistons are resistant to corrosion and are an ideal choice for professional flugelhorn pistons which must retain precise fit and smooth action over many years.